A number of Land System studies have been carried out by the former Soil Conservation Authority (SCA) and subsequent daughter groups (since the early 1960’s) to provide broadscale land type mapping in Victoria. 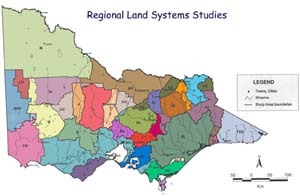 These Land System studies are generally mapped at a scale of between 1:100 000 and 1:250 000 scale and make up the basis (building blocks) for the Statewide Land System coverage, the only statewide coverage of land types for Victoria. It is hoped that a revised Geomorphological framework will be put in place in the near future to link the regional studies up to a national framework, currently being developed by CSRIO Land and Water – the Australian Soil Resource Information System (ASRIS) (external link). The regional studies vary in terms of scale, size of area studied and survey intensity. For example, the study of the Gippsland Lakes (Aldrick et al) had a team of seven persons undertaking fieldwork over a three to four year period. Other studies such as those for some of the former Land Conservation Council (LCC) (external link) reports had much less resourcing and relied on limited field information. Since these reports were melded together a number of other studies have been carried out on a Catchment Management Area (CMA) basis, though many of the reports shown here have been incorporated into newer studies. Other studies at a comparable scale have been undertaken by the former Department of Agriculture, such as the large study of South-western Victoria by (Maher and Martin 1987). Eventually it is envisaged that all the relevant studies including the more recent CMA based studies will be used to create a new statewide coverage of land types (including soil). There is still a need to have some areas surveyed (as well a revision with new new technology). Much of the public land, for example, does not have the same level of information as the freehold land, which makes developing broader overviews difficult. Lorimer, M. S., and Rowan, J. N. (1982). A Study of the Land in the Catchment of the Avoca River. Imhof, M., Thompson, S., and Rees, D. B. (1995). Land Systems. Report on the Alpine Study Area. Rowan, J. N. and Downes, R. G. (1963). A Study of the Land in North-Western Victoria. Land Systems. Report on the Ballarat Area. A Study of the Land in the Catchments to the North of Melbourne. Lorimer, M. S. and Schoknecht, N. R. (1983). Land Systems. Report on the Murray Valley Study Area. Lorimer, M. S. and Schoknecht, N. R. (1987). A Study of the Land in the Campaspe River Catchment. Land Systems. Report on the North Central Area. A Study of the Land in the Catchment of Lake Eildon. former Soil Conservation Authority, Victoria. Land Systems. Report on the North-east Study Area (Benalla-Upper Murray) Review. Land Systems. Report on the East Gippsland Area. A Study of the Land in the Catchment of the Otway Ranges and Adjacent Plains. Land Inventory in East Gippsland - A Reconnaissance Study. Centre for Land Protection Research, DNRE, Victoria. A Study of the Land in the Catchments of the Upper Ovens and King Rivers. A Study of the Land in the Grampians Area. Van de Graaf, R. H. M. and Hook, R. A. (1980). Land Systems. Report on the South Gippsland Study Area - District 2. Aldrick, J. M., Hook, R. A., van de Graaf, R. M., Nicholson, B. M., O'Beirne, D. A. and Schoknecht, N. R. (1988). A Study of the Land in the Catchment to the Gippsland Lakes, Volume 1.
former Land & Catchment Protection Branch, Dept. Conservation & Natural Resources. A Study of the Land in the Catchment to the Gippsland Lakes, Volume 2. Gibbons, F. R. and Downes, R. G. (1964). A Study of the Land in South-western Victoria. Hook, R. A. and Rees, D. B. (1999). A Study of the Land in the Western part of the Shire of Towong. Dept. of Natural Resources and Environment, Victoria. A Study of the Land in the Gippsland Lakes Area. Unpublished data, mainly interpretations by Rowan, J. N. and Rees, D. B. A Study fo the Land in the Gippsland Lakes Hinterland Area. former Land Conservation Council, Descriptive Report. White, L. A., Gigliotti, F. and Cook, P. D. (Eds). (1990). A Reconnaissance Survey of the Catchment of the Middle Reaches of the Goulburn River. Soil Survey in Westernport Bay Environmental Study 1973-74.
former Department of Agriculture, Victoria. Blackburn, G. and Gibbons, F. R. (1955). A Reconnaissance Survey of the Soils of the Shire of Kowree. former CSIRO Division of Soils. A Classification of the Land at Wilsons Promontory. A Study of the Land in the Catchment of the Kiewa River. Baxter, N. Brown, A. and Williamson, J. (1997). Dept. of Natural Resources and Environment. former Land Protection Division, Dept. of Conservation, Forests & Lands. Van de Graaf, R. H. M. and Howe, D. F. (1976). [as reported in Upper Yarra and Dandenong Ranges Land Management and Stream Environments Study (Volume 3 - A Study of the Land)].